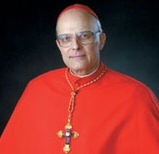 Bravo Cardinal George: May Others Follow Your Lead! "To put recent events in some perspective, I have asked Father Michael Pfleger, Pastor of St. Sabina’s Parish, to step back from his obligations there and take leave for a couple of weeks from his pastoral duties, effective today. Fr. Pfleger does not believe this to be the right step at this time. While respecting his disagreement, I have nevertheless asked him to use this opportunity to reflect on his recent statements and actions in the light of the Church’s regulations for all Catholic priests. I hope that this period will also be a time away from the public spotlight and for rest and attention to family concerns. "I hope also that the life of St. Sabina’s parish may continue in uninterrupted fashion. Fr. William Vanecko, Pastor of St. Kilian’s parish, will be temporary administrator of St. Sabina’s and will assure the full complement of ministerial services during this period. I ask the members of St. Sabina’s parish to cooperate with him and to keep him and Fr. Pfleger in their prayers. They are in mine."